This site has been developed to give a wider platform to the printed book ‘Stepping Forward: A Tribute to the Volunteer Military Reservists and Supporting Auxiliaries of Greater London’. It details the Lineages and Battle Honours of the Reserve Forces in Greater London from 1908 to 2014, including their links with modern-day units. The content is split into fifteen sections which can be accessed through the side bar to the left, and from each section you can choose to download a PDF of all or part of the publication for reading offline. You can also search for a particular Unit, Regiment, Battle Honour or Drill Hall. In 2008 the Reserve Forces' and Cadets' Association for Greater London published the Lineages and Battle Honours of London Volunteer Reserve Forces 1908-2008, including links with London Boroughs and Livery Companies. The original aim in researching and publishing the Lineages and Battle Honours was to ensure that the unique record of volunteer military service of Londoners was not forgotten. 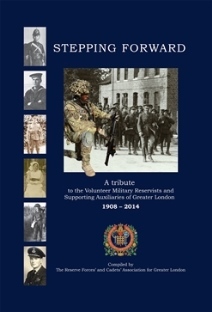 This detailed reference guide is published to honour London's volunteers who have served their country over the past one hundred and six years and to ensure that their record of service is not lost. It is in a format that will encourage attention from both old and young who are keen to find out about the Volunteer Military Heritage within Greater London. In commemorating the Centenary of the Call to Arms in 1914, ‘Stepping Forward' documents the record of the Volunteer Reserve Forces within Greater London from the inception of the Haldane Territorial Forces Act of 1908 to the present day. The book is divided into fifteen parts and has extended the scope of the original publication. It not only includes the Reserve of the Navy, Army and Air Force but also the supporting Auxiliary formations, such as The Royal Observer Corps and Voluntary Aid Detachments, as well as the various National Reserve organisations of the First and Second World Wars. The amendments that have been made to the original six parts are as a result of ongoing research. The Lineages set out in Part 3 were originally compiled by Major PR Bateman, drawing on a number of sources, noted in the Bibliography. They have been edited and updated. They draw heavily on the Historical Record of The London Regiment by Colonel AR Martin (1975) from which the tables in Part 1 are taken. The Lineage lists in Part 3 show the many changes of title and linkages. They also show who are the descendant unit or units. They record the Battle Honours and Honorary distinctions awarded to each of the units. Part of the reason for producing this record is to ensure that these Honours, won by Londoners continue to be properly recorded and remembered. Following the guidelines and principles set out in Part 2, the Regiments responsible for holding these Battle Honours today are set out in Part 4. No claim has to be made for those Battle Honours. They are entitled to be shown in the Army List, in unit Drill Halls and where appropriate on Standards, Guidons, Colours or Regimental Appointments. The emblazoning of Battle Honours on Colours is subject to special rulings about succession rights. Not only do the Lineages show many changes, so too do the organisation, size and structure of the Civic authorities in London. Boroughs have also amalgamated and the boundaries of the Capital have changed. These records include units which were at one time during the past one hundred and six years connected in some way to the London of today. These records concentrate mainly on The London Regiment, set up as part of the new Territorial Force in 1908; but they also cover Yeomanry Regiments associated with the City and County of London as well as The Middlesex Regiment Territorial Army Battalions which were essentially London-based units; and The Parachute Regiment's London Battalion. They also include Royal Naval, Royal Marines and Auxiliary Air Force units which were London-based. Thus in Part 5 covering Civic Honours, there may no longer be descendant units in the Boroughs which granted these honours. They are nevertheless recorded. The introduction to Part 5 also explains the various designations used in granting Civic recognition (‘Freedom of' or ‘Adopted by' et cetera). The Royal Regiment of Artillery features in the lineages, as well as in the records of those units which converted to Royal Artillery at some time during the past century. Similarly, the units of the Corps of Royal Engineers appear in some Regiments' Lineages. The Royal Corps of Signals units appear only as descendant units of Yeomanry or of Battalions of the London Regiment. Part 6, which lists London units which have affiliations with Livery Companies, records affiliations with units of all three Armed Services whether linked to London or not. As new Livery Companies and new linkages continue to be formed, these will be captured in the on-line version of this book. The register of Drill Halls at Part 9 is inevitably incomplete, as their demolition and sale, particularly in the late 1950s and early 1960s, has made some locations difficult to trace. However, one reliable source of information has been the Reserve Forces' and Cadets Association for Greater London's archives of vintage recruiting literature and the 1936/38 London Division staff lists. The register of Colours, Standards & Guidons in Part 10 is complete but for the Guidon of the King's Colonials (King Edward's Horse) that cannot be traced. The main challenge with laid up Colours has been the difficulty in obtaining acceptable images from sometimes dark and lofty locations. The Directory of Memorials in Part 15 is missing the individual unit memorials that so far cannot be traced. In the additional Parts to the original publication, the idea was not to produce in-depth histories, but rather to record the contribution of all Volunteer Military and Auxiliary Units within the Greater London area and to pay tribute to all who served, and had the spirit and courage required to Step Forward.